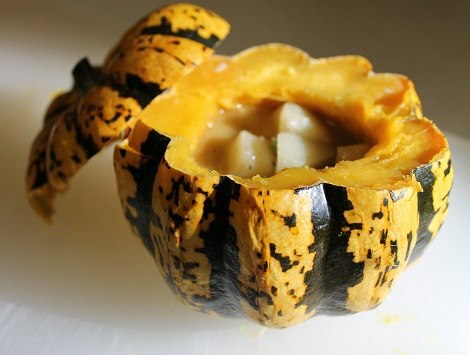 Potato soup in a carnival squash. Let’s have a carnival up in here! Shall we? Oh yes, let’s do!!! A carnival squash that is! We have it available this week and let me tell you how I take this perfectly healthy vegetable and turn it into hip enhancing goodness. 2. Make some broth based potato soup (broth, potatoes, seasonings, and celery and onions if you have them laying around). 3. Pull the squash out, cut the top off, scoop out the seeds. Add a dollop of sour cream and then put the potato soup over the sour cream. 4. Serve, eat, and feel happy in your heart.